It was a printing, cutting and laminating kind of day! Ok...let's be real...it was a hang out with several other moms while our kids played outside in the oh-so-fabulous-beautiful weather! Before I knew it, it was 3 hours later. Good friends, great weather and nothing but time! Then, I came home to cut and laminate. When we get back from Spring Break, we are going to hit several reading skills hard! Our state test is right around the corner. There has been a HUGE push in math...time for some reading review! I love Rachel Lynette's Task cards! 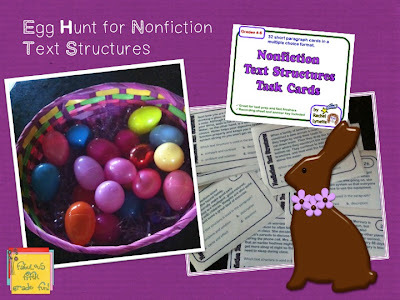 We are going to start with informational text structures. Another Dollar Tree find! Party trays! All the glass beads (Walmart) go in the middle. As a student correctly answers a question, they get a bead. I also used Rachel's SUMmarizing task card set right before spring break. Summarizing is such a hard concept. Rachel has a great little nemonic device for remembering how to write a summary. I set the task cards up around the room like a scavenger hunt. My students had a great time writing the summary in 12 words or less. It was so fun to stand back and listen to the conversations about what 12 words would make the best summary! 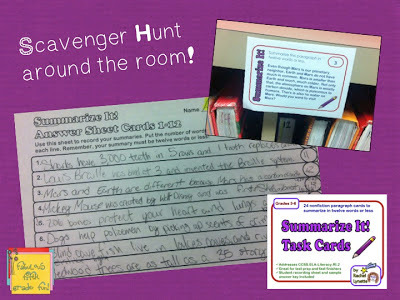 If you have used Rachel's task cards, I would love to know how you incorporated them in your classroom! 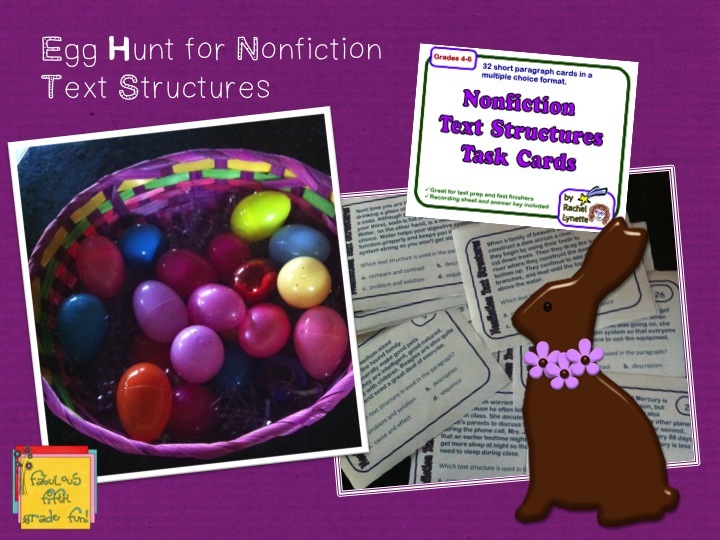 And...if you want some more ideas on how to use Rachel's task cards...Click here! Cards laminated and eggs stuffed...now it's time to watch a girly movie, cuz the hubby is out of town! 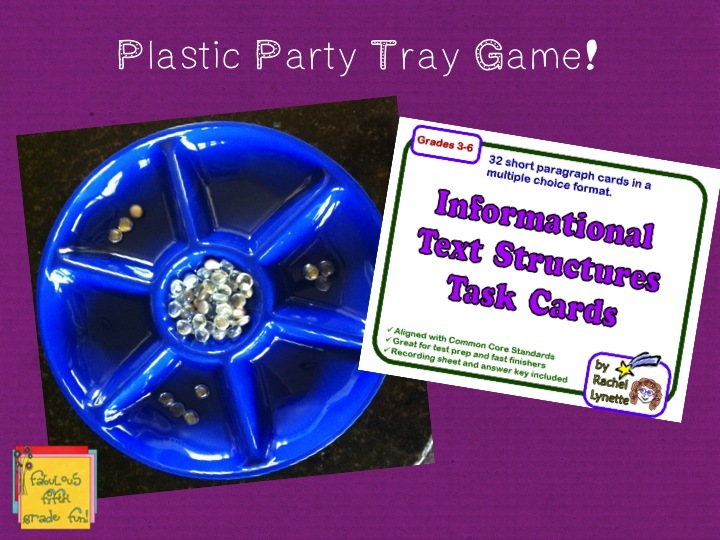 I LOVE the party tray idea - definitely going to need to pick one up ASAP. Thanks! Glad you like the ideas! They have some really cute trays! Wow, that plastic party tray idea is great! It's one of those things that make you kick yourself for not thinking of it already! Next time I see them I'm picking some up for sure! I might just have to try out some of these task cards as well! The task cards are great! My students love them. I love them...great for small group or whole group. I love going to Dollar Tree...cruising' the aisles...looking for ideas! I love the party tray idea as well as your egg idea! I have tons of plastic eggs I could use! Thanks for sharing! Thanks! Heading over to your blog! Wonderful ideas! It's so funny that I just found your blog- I just wrote a post yesterday about how much I love the cards too! Thanks for sharing your wonderful ideas! I am your newest follower!